Make yourself at home in one of the 38 air-conditioned rooms featuring kitchens with refrigerators and stovetops. Rooms have private balconies. 42-inch LED televisions and DVD players are provided, while complimentary wireless Internet access keeps you connected. Conveniences include safes and desks, and housekeeping is provided daily. Located in downtown Deira and at an approximately 10-minute driving distance to the Dubai International Airport. 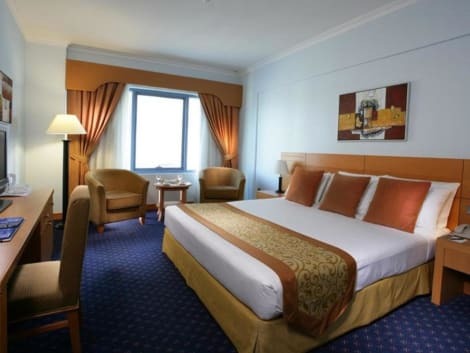 The Hotel is within walking distance of Dubai Creek, the famous Dubai Clock Tower and the lively Al Rigga Street. Leisure guests at the hotel can make use of the on-site gymnasium and rooftop swimming pool, which offers fine views over Dubai. Nihal Palace Hotel is located at a short distance from the World Trade Centre and Exhibition Halls, Heritage Village, Mina Bazaar. City Première Hotel Apartments ? Deluxe, Dubai is an impressive 43 storey luxury apartments with a total of 271 luxurious suites consisting of 170 one bedroom, 61 two bedrooms, 38 three bedrooms and two Penthouse consisting of four bedrooms , is the epitome of modern elegance located in the prestigious downtown Dubai on Sheikh Zayed Road. It is literally steps away from the world's tallest iconic building Burj Khalifa with its cybernetic fountain display, few minutes away from World Trade Centre, Dubai International Financial Centre (DIFC), Dubai International convention centre (DICC). It is minutes away from 'The Dubai Mall- the world's largest shopping and entertainment mall which is home to some of the world's finest designer brands, the world-class Aquarium, ice rink and the first THX-certified cinemas in UAE. Near to Dubai Creek Golf Club, Jumeirah Beach Park and Jumeirah Mosque, walking distance to Business Bay Metro Station, direct access to Dubai International Airport. In view of its close proximity to the city means it is ideally located whether you are coming to Dubai for business or leisure. It is known for its luxurious accommodation with floor-to-ceiling windows in each Apartment with contemporary furnishing including free wireless internet access, LCD flat screen televisions, overlooks the breath-taking view of the Dubai city and Burj Khalifa view. Take time to pamper yourself with a visit to the full-service spa. After dipping into one of the 2 spa tubs, you can spend some time at the private beach. Additional features at this Mediterranean aparthotel include complimentary wireless Internet access, concierge services, and babysitting/childcare (surcharge). Featured amenities include wired Internet access (surcharge), complimentary newspapers in the lobby, and dry cleaning/laundry services. A roundtrip airport shuttle is provided for a surcharge (available 24 hours), and free valet parking is available onsite. Grab a bite at Toko Dubai, one of the hotel's 4 restaurants, or stay in and take advantage of the 24-hour room service. Wrap up your day with a drink at the bar/lounge. Buffet breakfasts are available daily from 6:30 AM to 10:30 AM for a fee. Enjoy international cuisine at Kenza Restaurant, a poolside restaurant which features a garden view. You can also stay in and take advantage of the 24-hour room service. Buffet breakfasts are available daily from 6:30 AM to 11 AM for a fee.